The new Center for Design Thinking brings together multidisciplinary teams to innovate and solve complex problems with the end user in mind. Great ideas—from products to apps—only go so far if they don’t appeal to consumers with a desirable and functional design. That’s where the Institute of Innovation and Entrepreneurship’s Center for Design Thinking, located in the new Engineering Education and Research Building, comes in. “Every automobile starts off as a sculpture. Every app is a blend of visual arts and computer science. The idea is to start to bring those two communities together to get students thinking along those lines of blending the aesthetic together with the technical,” says College of Engineering and Applied Science Dean Michael Pishko. Design thinking is a methodology that provides a solution-based approach to solving complex problems and creating desired outcomes that benefit the end user. It involves five stages: empathize, define, ideate, prototype and test. Co-directed by Department of Visual and Literary Arts Assistant Professor Brandon Gellis and Department of Computer Science Associate Professor Amy Banic, the Center for Design Thinking will work with faculty, students and businesses to apply design thinking and explore possibilities. The center will launch this fall when the Engineering Education and Research Building opens for classes. It’s a place where those from different disciplines can work and learn together. To teach design thinking, the center will offer cross-disciplinary courses, tutorials and workshops. The center will include prototyping materials, such as virtual reality technology, microcontrollers and art supplies. Those teams that are ready for the next phase of development can move on to the Student Innovation Center located in the same building. Banic and Gellis plan to create design competitions for students that will work in conjunction with the entrepreneurial and startup challenges currently in existence. They also plan to offer design-a-thons—multiday events for students, researchers and industry leaders that will bring them together to work on innovating new solutions. 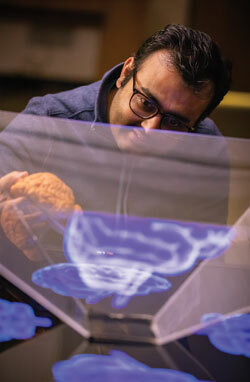 In addition, the center will work with researchers to integrate design-thinking principles. “Research can lead to growth in intellectual property and even additional startups and entrepreneurship efforts,” Banic says.